Sports Business Classroom is excited to announce that Jeff Dorso, Senior Vice President and General Counsel of the Sacramento Kings, will be a featured presenter for the 2018 SBC session. 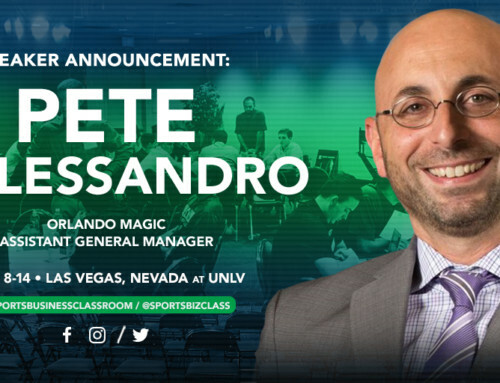 As a featured speaker at the 2018 Sports Business Classroom, Dorso will be part of an all-star lineup of sports business executives that are teachers and presenters. Previous years at SBC have featured NBA Commissioner Adam Silver, Washington Wizards Head Coach Scott Brooks, ESPN’s Adrian Wojnarowski, Ned Cohen of the Philadelphia 76ers, Toronto Raptors GM Masai Ujiri, and the Vegas Summer League’s very own Warren LeGarie. Jeff Dorso is Senior Vice President and General Counsel of the Sacramento Kings. Dorso is responsible for all legal and real estate matters associated under the Sacramento Kings parent company, including the Sacramento Kings, the Golden 1 Center, Kings Guard (the NBA 2K eSports team), the Sacramento Kings Foundation, and the Stockton Kings (NBA G League team). Dorso was instrumental in structuring the landmark deal structure for the public-private partnership that resulted in the Golden 1 Center and surrounding development and kept the Sacramento Kings in Sacramento. He graduated from UC Davis and received his law degree with a Sports Law Certificate from Tulane Law School.